Now that Hurricane Harvey’s rain has fallen, it comes time to assess the damage and clean up your pool. 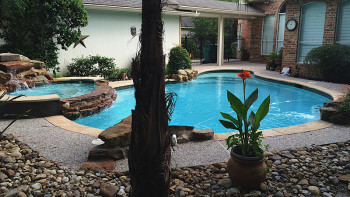 There are several factors to consider when cleaning or draining your pool, between your safety, particulates in the pool and rebalancing the chemistry of the water. We did a short “what to watch for” post last year during the torrential spring rains that Southeast Texas was getting. That’s a good reference while evaluating what you need to do. 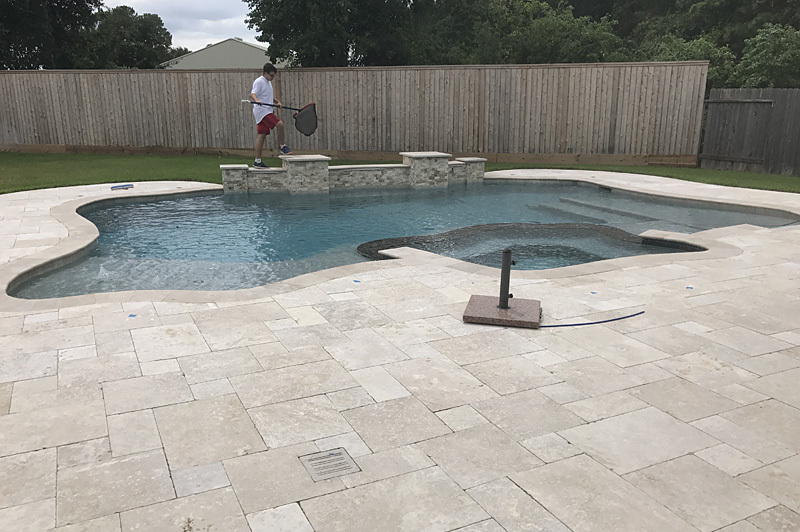 The above picture shows one of our pools in the aftermath of Harvey. 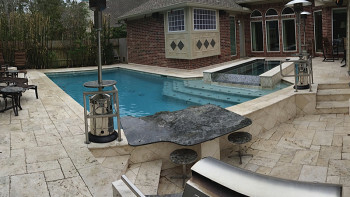 The owners were lucky not to have much in the way of flood damage, and their IntelliChem system did its job in helping keep the pool’s chemistry on point throughout the storm. 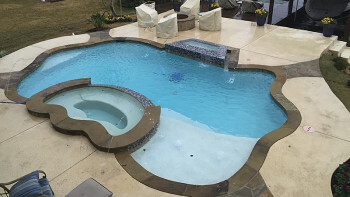 We offer the IntelliChem system with all of our pools, and having one — and putting it to use — drastically reduces the need for draining your pool. Unfortunately, Harvey wasn’t as kind to all of our customers in Montgomery County and Southeast Texas. Some of them fell victim to the flooding that plagued (and still plagues) the region. That resulted in pictures such as the two below. 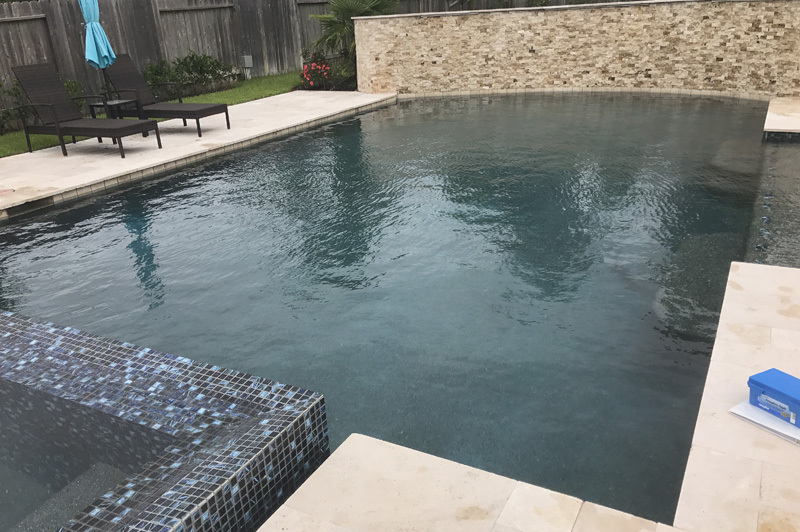 In the cleaning your pool article that was linked in the first paragraph, there were three things that needed to be monitored: safety from fallen items/animals that might have drifted in the pool area, particulates such as dirt/mulch and leaves, and water chemistry. Since Harvey was much more a rain event than a wind event in Montgomery County, falling debris from trees and houses weren’t as much of a concern. 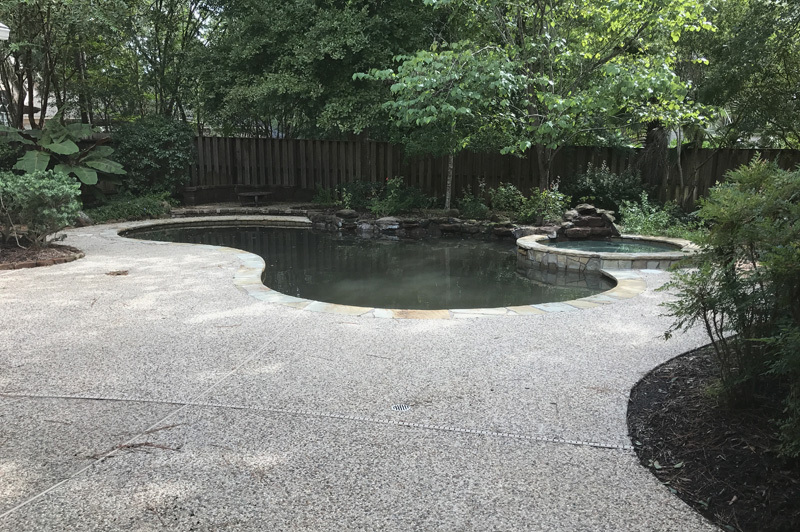 However, insects, reptiles and small mammals could have been washed into your pool area (depending on how much flooding you received) and the sheer amount of rain water will throw your chemistry off. But a big X-factor in the Harvey clean-up will be keeping mindful of possible bacteria. 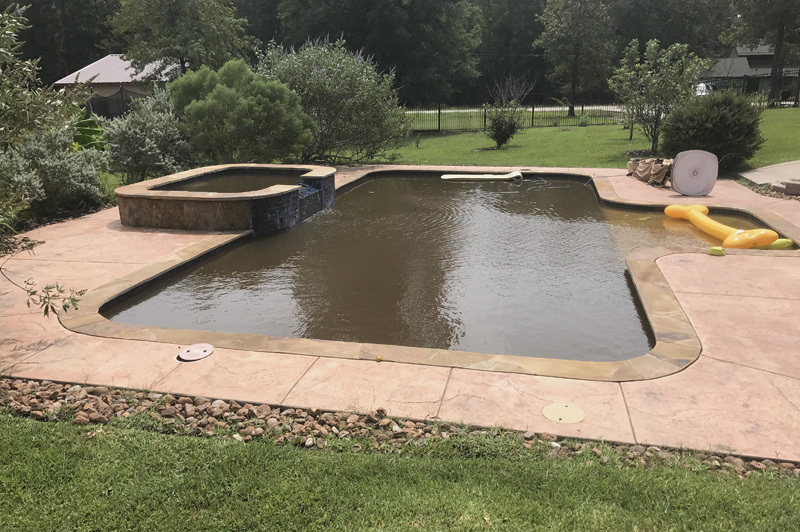 The Association of Pool & Spa Professionals warns that animals and possible sewage in flood waters can cause spikes in E-Coli and other harmful bacteria. It advises using bacteria test strips on the water to get readings. If there is a bacteria issue, chlorine might not be effective, so use products such as Sea Klear PRS Stage 1 and 2 to break down the bacteria and trap it in your filters. We covered the process of this last year, which we paired with the other linked article in the first paragraph. Please feel free to read this, but we’ll also highlight a few things that might be relevant for this storm. One of the main things you need to do is clean your filters constantly. The filters serve as an integral part of the cleaning process, as they trap the debris and separate it from the pool water. However, when you’re dealing with floods and rain water of this degree, the filters will get full, overwhelmed and not do their job fully if left unmonitored. Therefore, it’s important to clean and empty them yourself or call us to do it for you for a fee. Cleaning and emptying filters are available for a fee as part of our pool maintenance services. Along with keeping the filters in tip-top working shape, you also need to brush your pool several times a day. Brushing the pool uproots debris that’s clinging the surface of your pool and releases it into the water. From there, the filters and vacuums can capture and separate it. Brushing the pool also is huge in preventing algae from forming down the road. It also allows the IntelliChem system to balance the water chemistry more effectively. As far as dont’s, do not ever drain the pool completely. If you do that, the shell of the pool will “pop up” and “float” out of place, causing an extreme headache and even more labor. The saturation of the ground after a rain event like Harvey makes a dislodged shell even more of a concern, as the moisture and dirt below the surface push the shell out if there’s not enough volume inside the pool to push back against it. It’s a phenomenon we detail in this article. Instead, drain the pool no more than halfway and refill the drained portion with clean water. From there, use vacuums and filtration to further clean the water, along with the IntelliChem system’s water chemistry capabilities. Sometimes one draining will do the trick; sometimes you’ll need more. Either way, never drain the pool more than halfway. 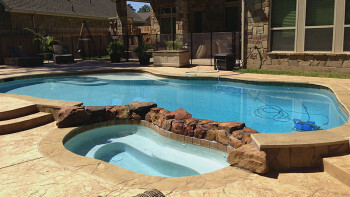 This is another service we provide for a fee as part of our pool maintenance package. Either way, your pool will once again look like this. Give us a call for help in this area, and stay safe.